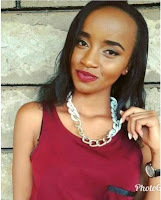 Thursday, April 11, 2019 - The mother of Naftali Kinuthia, the 29 year old man who hacked his girlfriend, Ivy Wangechi, to death on Tuesday morning in Eldoret, says she was aware her son was in a relationship with the deceased. According to Kinuthia’s mother, her son had shown him photos of Ivy and informed her that he was planning to bring her home for introduction. However, the introduction didn’t happen after she learnt that their relationship ended late last year. The distraught mother describes her son as a calm boy and revealed that she was shocked after receiving shocking news that her son had hacked Ivy to death. Here’s the interview she had with KTN.